Every citizen in the United States of America is allowed a vote. I get that. You may vote Republican or Democrat for any reason you see fit. That is your right. If you are a sanctioned member of the Baseball Writers Association of America, you are in a select group, and - while you're vote is your prerogative - you have an at least an obligation to explain why you voted one way or the other. If you are a baseball columnist in San Diego, maybe you don't watch much East Coast baseball. I can understand that, as I don't watch much West Coast baseball. Time differences are an inconvenience. But if you are the only, single, person to have not voted for New York Mets' pitcher Jacob deGrom for the Cy Young Award - awarded yesterday by a 29-1 vote - you, as a sanctioned voter, should at least be able to explain your vote. If San Diego Union Tribune Padres reporter John Maffei feels like voting for Washington Nationals' Max Scherzer, go for it! Scherzer had an 18-7 win-loss record with exactly 300 strikeouts in 220.2 innings pitched. In most seasons those statistics are award worthy. Just not this season. If those statistics alone (and if you don't watch East Coast baseball) swayed your vote, say it. If you live in San Diego and just dislike the New York Mets (for some reason), say it. I can understand those reasons. But if you are going to be given a BWAA vote, it is your professional responsibility to at least pay attention to what teams you don't cover are doing. And if you are even a casual baseball fan, you should have known that Jacob deGrom pitched to an ERA that defied his run support. 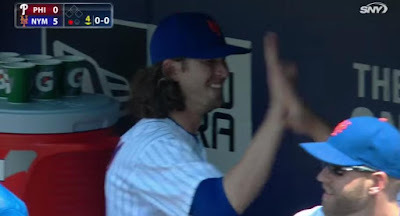 As a National League pitcher who steps to the plate, deGrom also had 11 hits in 30 starts, with 5 RBIs and a respectable (for a pitcher) OPS of .390. At the end of the 2018 MLB season, Jacob deGrom should get a Nobel Peace Prize for not murdering anyone on his team for scoring less than three runs every time he took the bump. And the only BBWA baseball writer who didn't vote for deGrom to win the Cy Young Award should at least explain why he did so when he is on a radio show in New York City. Just the couple of minutes before any interview, you should prepare your answer to the most obvious questions you are about to be asked. Dude...Just for the record say it was about the 300 strikeouts or the 18 wins just so nobody can call you an ignoramus who doesn't pay much attention to the sport which you are paid to kind of pay attention to. As a New York Mets fan, I watched for free...Trust me, it wasn't all that pretty this year. *Update -- Here's the San Diego Union Tribune Padres douche reporter hanging up on WFAN's Steve Somers.